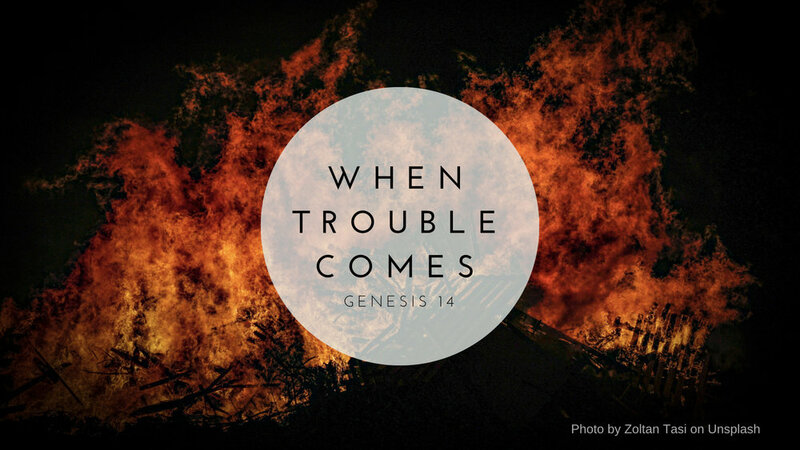 As we continue our journey through the book of Genesis we will take a closer look at chapter 14 and the lessons we can learn from the life of Abram and his relationship with God. Right at the beginning of Genesis 14, it is interesting to note that even though Chedorlaomer is the leader of the alliance Amraphel is mentioned first. This is not by chance, Amraphel is mentioned first because he is the king of Shinar, which is where the tower of Babel was built, and as we mentioned on a previous post Babylon plays an important role throughout Scriptures all the way to the book of Revelation. The threat of Genesis 14 originates in the place that Abram left, the place where God dispersed all the peoples after the flood. The mindset that led to the building of the tower of Babel in an attepmt to create a major world empire was alive and well and was causing trouble all the way in the land of Canaan. For twelve years the western kings paid tribute to an eastern alliance of Kings lead by Chedorlaomer. On the thirteenth year they decided they would not pay. Perhaps they said something along the lines of, "No Taxation without representation!" One year later, on the fourteenth year, Chedorlaomer and the eastern alliance decided to attack. Let's call the coalition that is invading from "Babylon" (Babylon does not exist yet but will exist int he same geographical location) the Eastern Coalition. Amraphel is mentioned first and he is the king of Shinar which is where previously the tower of Babel was being built. Arioch is a bit of a mystery but he is from the same general area. Chedorlaomer is the leader of the coalition and is from Ancient Persia (modern southwest Iran). Tidal is the king of Goiim (peoples) sometimes translated as nations. We are not too sure what his title means but we do know he was a Hitite king. Let's refer to the kings who are bing attacked as the Western Kings. There are some interesting things happening with the names of these kings, more specifically two of them. The king of Sodom is called Bera, which literally means "in evil." There is some debate whether these were titles given to them by those around them, like a mean nickname, or if their names sounded similar to these Hebrew words and were mispronounced on purpose, or if these are names given to them by the biblical writer or Jewish community as a way of reflecting his character. We have a similar issue withe the name for the king of Gomorrah, Birsha, which means, "in wickedness." We know even less about the other kings who made up Western Kings coalition. Shinab was the king of Admah, this name pops up in Genesis 10:19 and Deuteronomy 29:23 but we do not know much more about him. 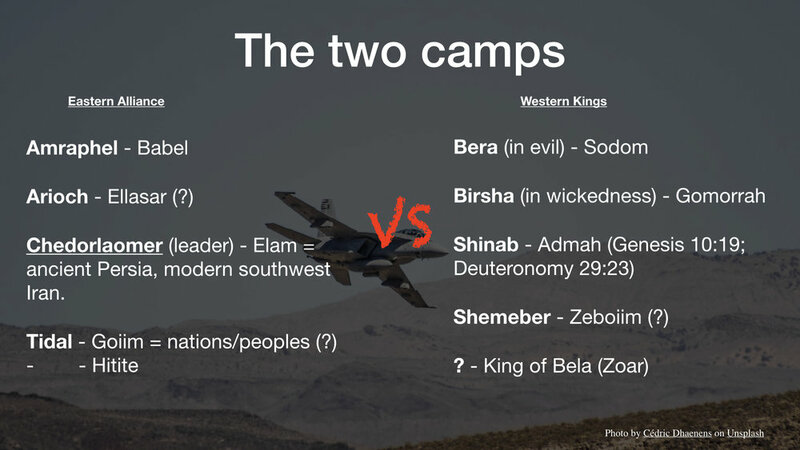 We know even less about Shemeber king of Zeboiim and we never even get the name of the king of Bela, but keep in mind that the name is later changed to Zoar, this will be meaningful on a later post. The fact that there is so little information about the Western Kings says something about their legacy. But we will cover that in more detail when we discuss Genesis 19. Chedorlaomer and friends defeat 6 "peoples" (they are not really nations in the modern sense, it is difficult to find a modern equivalent for these people groups) on their way to Sodom. The Eastern Alliance's itinerary of military victories is very impressive and builds the tension, or excitement, as Chedorlaomer approaches Sodom. So far the Eastern Alliance have found no match for them in the west. Now the Eastern Alliance will face the Western Coalition. Numbers wise, the Western Coalition has the advantage, however, the Eastern Alliance has an impressive track record, six victories and zero defeats. Genesis 14:10 says the kings of Sodom and Gomorrah fled to the mountains. Verse 11 tells us that the victorious eastern alliance then took all the goods of Sodom and Gomorrah and all their provisions and went their way. And they would have gotten away too, if the story ended here. The taking of Lot will be Kedorlaomer’s undoing. If he had not taken Lot captive, chances are he would have left with no complications. But when he took Lot captive it changed everything. The text says that Lot was the son of Abram’s brother, that is Abram’s nephew. This mention anticipates Abram’s involvement. And surely enough, someone did escape and run to tell Abram what happened (Genesis 14:13). Abram is not a king and is not part of the coalition. However, his neighbors realized the benefits of being Abram’s allies (verse 13), oddly Lot had enjoyed those benefits for a long time but gave it up when he moved to a “better place” (Genesis 13). Lot is surprisingly passive throughout this narrative. Lot apparently did not join in the fighting nor did he flee to the mountain. He does not reach out to Abram at any point, maybe his pride kept him from asking his uncle for help. There is no mention of Lot praying, fighting, fleeing, calling for help... Actually there is no mention of Lot doing anything except being taken. On the previous chapter (Genesis 13) Lot is so eager to decide his future and pick a place to live and leave Abram’s company. Abram is passive, allowing Lot to decide where he wants to go. Now by contrast Lot is completely passive and Abram takes action immediately. But before we discuss Abram, can any of us relate to Lot? Have you distanced yourself from God seeking an easier life? Perhaps you were searching for more comfort? While searching for these things have you ever found yourself just caught in a huge mess? Have you ever been tempted to believe that life would be easier if you did not have to be faithful to God? Have you ever felt like faithfulness to God was a heavy burden? Like you would be better off making your own decisions? I mean, Lot knew all about God. Its not like Lot became a pagan. He just distanced himself a bit, for clear benefits, benefits that made sense, benefits that he could clearly see! The Plain of the Jordan clearly looked like a better move, a smart move, it just was just not where God had called him to be. We discussed this in more detail on a previous post. Lot’s decision, based on what was appealing to his eyes, had cost him everything. All his possessions were taken by the invading armies, and he even lost his own freedom. Lot’s decision to distance himself from God seemed harmless, or even like a good decision, until trouble came, and when trouble came Lot found himself in need of a deliverer, except no one around him was able to help. A coalition of 5 kings could not stop the enemy. Everything that Lot had trusted, all he depended on failed him. Genesis 14:14 tells us that Abram heard that his brother was taken captive. While Lot distanced himself from Abram, Abram held no grudge and even considered him a brother rather than a nephew. Abram armed his 318 men (verse 14). This is not counting any outside help, these are the men who were born in his house! This “army” was a blessing from God as God kept His promised and blessed and prospered Abram. Abram had substantial wealth and power. Lot was blessed to have such a benefactor come to his rescue. Abram’s family (household) was not only prolific but also loyal. While Lot is passive in this story Abram thinks of Lot as his brother, Abram loves, reaches out and goes to battle for Lot. Abram not only attacks but pursues the enemy and brings back all the goods, plus Lot and his goods, as well as the women and the people (verse 16). Abram just defeated the previously undefeated Chedorlaomer, and he did it pretty much single-handedly. There is no mention of a significant contribution from his allies. Abram and his household did what the five kings of the west were unable to do. Abram marched with his men all night and caught the enemy by surprise. Chedorlaomer, in all likelihood, did not expect anyone to attack him. I believe that to the best of his knowledge he had defeated everyone who could possibly be a threat to him. He attacked cities, peoples, and kings. He took all their possessions, so his defeated enemies would be unable to hire any help. Chedorlaomer was overconfident and let his guard down. He never saw Abram coming, he never expected one man, one household/family to defeat him, especially not a man that lived a peaceful life camping by some trees. Chedorlaomer and friends likely confused peaceful living with cowardice. Abram was kind, he was good, he was friendly, he was a spiritual man, a godly man, a man of faith, but he was no coward. Abram preferred to avoid fighting and violence and had successfully done so for many years. Loving peace does not mean being a coward. Avoiding conflict does not mean not being willing to fight. Abram was not going to sit idly while his brother was in need of help. Abram could have said that Lot was getting his due. Abram could have said Lot had it coming. But when Lot was in need Abram came to his rescue. Once Abram returns victorious, the king of Sodom went out to meet him (verse 17). Right after that the text mentions how Melchizedek king of Salem brought out bread and wine (verse 18). Melchizedek is a mysterious character, there is no introduction for him, he just shows up. There is no genealogy mentioned. Also this is the first time the word “priest” shows up in the biblical text. The blessing that follows is also the only priestly blessing in all of Genesis (verse 19-20). Melchizedek is identified as king of Salem (verse 18), which is widely recognized as an ancient name for Jerusalem in Jewish tradition. Also, the name Salem means “peace”. Furthermore the name Melchizedek means King of Righteousness (Hebrews 7:2). I will refrain from going deeper regarding Melchizedek but I find it important to mention that Melchizedek was not Christ, and that he was a man, a human being. The king of Sodom “came out” to meet Abram (verse 17), but Melchizedek brought out food and offered a blessing (Verse 18). The first word spoken by the king of Salem is “blessed,” (verse 19) but Sodom’s king first says “give me” (verse 21). The king of Sodom tries to bargain with Abram for a portion of the spoils of war (verse 21). Meanwhile Abram wants none of it (verse 22-24), but he does give a tenth of it to Melchizedek (verse 20), who did not ask for anything (verses 18-21). Abram also gives to his allies their fair share (verse 24). I believe it is worthwhile to note that Abram "gave [Melchizedek] a tithe of all" (verse 20). Abram already had the victory. Abram did not need any special favors from God. Abram is not giving his tithe to God in an attempt to purchase blessings, rather he is returning to God 10% of what God gave him. In returning the tithe, in giving Melchizedek the priest on tenth of all, Abram was making it clear to all around him that the victory came from God. God had caused Abram to be victorious and Abram recognized that and showed it by giving Melchizedek one tenth of all. Remember that this predates the tabernacle and temple, this predates the Levite priesthood. Tithing, predates the formal establishment of the people of Israel as a nation or the laws commonly referred to as the Laws of Moses/ Mosaic Laws. I won't go further on this topic at this moment but the implications of Abram's actions are worth pondering. Abraham refused to take advantage of the unfortunate. Few people would have resisted the temptation of gaining great wealth by this means. Abram’s example is a rebuke to those who posses a self-seeking spirit. Abram gave no opportunity for anyone to claim that he engaged in war for material gain. No one could say Abram became wealthy at the cost of others, or by taking treasures by force. Abram did not become wealthy because the locals gave him gifts, but rather because God promised to bless him and God alone was to remain the reason for Abram’s wealth and power. Now Abram had become involved in local wars. He had been a man of peace and as afar as possible, he avoided enemies and conflicts. Now he had witnessed the carnage and horrors of war. The nations whose armies he had defeated would likely gather their forces for a future attack, and would make Abram a special target for vengeance. The peace and quiet he once enjoyed were now in the past. What would happen in the future? He still did not have an heir. ...to be continued on my next post. The world is a dangerous place. Even when Abram does his best to avoid trouble, trouble finds him. But God is with Abram. God blesses Abram and Abram is a blessing to those around him. The king of Sodom is aware of Abram, and his God. Lot witnessed God’s protection through Abram. Lot and the inhabitants of Sodom and Gomorrah have a great opportunity to change their lives. They were just rescued by God through Abram. The inhabitants of Sodom and Gomorrah are not ignorant of who Lot is, of who Abram is. They owe Abram their lives, their freedom, their possessions. They had the opportunity to ask Him and learn about the true God, the God of Abram. Keep this in mind. When we choose to be faithful to God, not only are we blessed and protected, we also become God’s instruments on earth to bless others, both physically and spiritually by spreading knowledge about the true God, the God of Abram, God Most High, our God.